On the 3rd of this month, I "observed" my 54th birth anniversary. I do not write "celebrated", because celebrations are to be had with friends and colleagues, and this is something our local social structure does not really engender in Al Muwayh. Most doctors here are Arabs, and stay here with their families, so there is no chance for them to invite me over to their place for a mere birthday celebration; neither is it possible for me to call them over to my place without their family. I cannot invite my nurse friends to join me at any place for a celebration. Thus, I am practically alone when it comes to such situations. Earlier, I had planned to go to Ta'if on the third of March and splurge on food and desserts in the mall. However, I got delayed in the hospital and could not possibly leave at or after half past five to travel to Ta'if and then return to Al Muwayh the same night! The fact that I haven't received my salary for the last month also weighed in, and hence I decided to defer my visit and wait until my next visit to Ta'if at the end of the week. I did have an ice cream and a small piece of chocolate cake ... each of which cost me 1-2 Riyals. Also, I ate my lamb curry and Turkish nan for lunch. 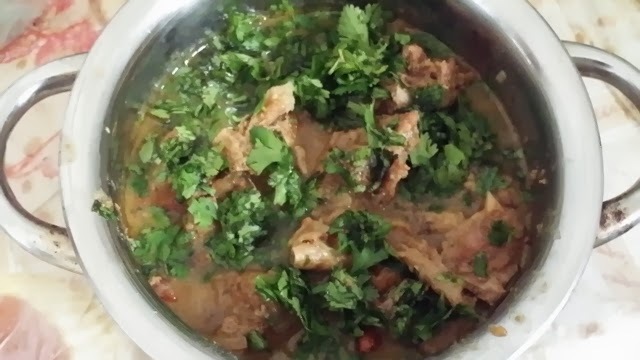 This time, I made the lamb curry with some changes in the normal procedure. I added the Bohra curry masala and also some coconut milk; this has given it the bland colour that you see in the picture. 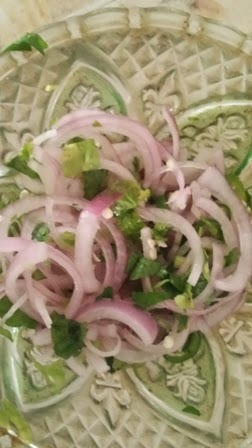 It tasted lovely, especially as I ate it with kachumber - I had chopped some onions and prepared it - it is a sort of accompaniment that has onions, coriander leaves, chopped green chillis and salt with lemon. For dinner, I went to a local restaurant run by Afghanis and ordered and had a half tandoori chicken with rice, a meal that I have been eyeing since a long time. I really enjoyed it. Thus ended my birthday. I did talk with my family on Skype, and they cut a nice Mongini's roasted almond cake to celebrate my birthday! In addition, right from the evening of the 2nd, I started getting congratulatory messages on Facebook, Whatsapp, SMS service, phone calls and also in person from some of the nurses in the ER, where I had gone with a few pieces of cake to give to them. The next morning, it was back to normal. A few "belated" messages continued to trickle in. I think I received no less than 150 messages on Facebook, and at least 40-50 more through the other media. Through this blog, I wish to thank all my friends for remembering me! THANK YOU ALL.